Conducting a successful migration from Fortis to DocuWare takes more than technical expertise. Migrations present customers with a number of challenges – both real and perceived – especially the challenge, or fear, of change. Working with a partner that has completed many successful migrations can help ease the anxiety of making the move. Below is a snapshot of our proven migration methodology including custom migration components that ensure a smooth and successful transition. Feedback from customers who have made the switch offers the most compelling evidence of the benefits of embracing process improvement, implementing new technology, and selecting an experienced partner. 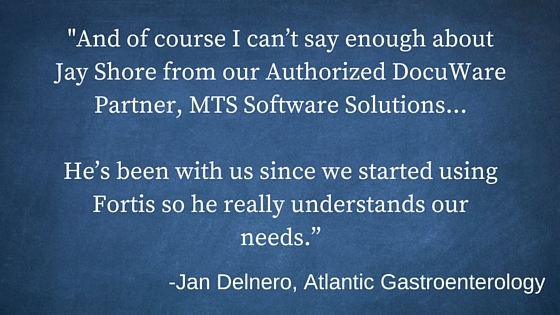 Jan Delnero, Business Administrator at Atlantic Gastroenterology Associates/Atlantic Gastro SurgiCenter – an MTS Software Solutions customer, shared her thoughts on their recent Fortis to DocuWare migration as well as her perspective as a new DocuWare user. “Because we still had access to Fortis while they were installing DocuWare and moving everything over, the process was not an inconvenience for us. Making the switch didn’t require days of training. It took about 20-30 minutes of remote training for each person to learn how to use DocuWare. It’s easier to scan, index and look things up in DocuWare, so my staff was really happy and receptive to the change. Having the Smart Connect button embedded in our medical management system is one of the best new features for us. You can just click the button and the patient’s chart immediately comes up. We also like being able to split the screen to do multiple searches. It helps communications between our surgery center and the gastroenterology medical practice. If a patient is coming into the office for a follow up appointment after a procedure was done our staff pulls up the records in the practice section database and at the same time they pull up the procedure in the surgery center records. They can work with both records directly in front of them. Ready to Upgrade Your ECM from Fortis to DocuWare? 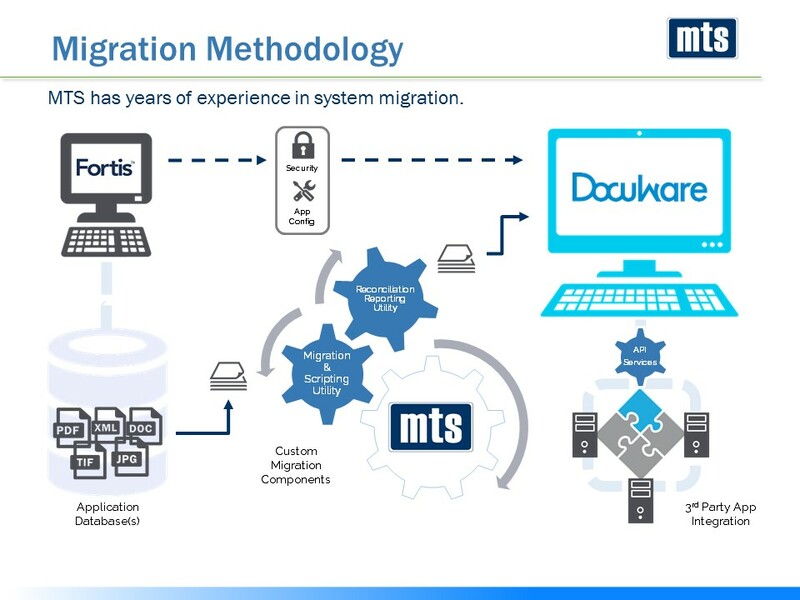 As Authorized DocuWare Partners and long-time Fortis implementation partners, MTS Software Solutions is well-suited to handle your migration from your existing ECM to DocuWare. In fact, we’ve handled a few migrations in our day. You can view a recording of our webinar that includes important details to prepare you for an upgrade as well as a demo of DocuWare functionality. Ready to make the switch? Not yet? Need more information? No problem. If you’d like to speak to a consultant or if you just want to pick Jay’s brain, let us know! 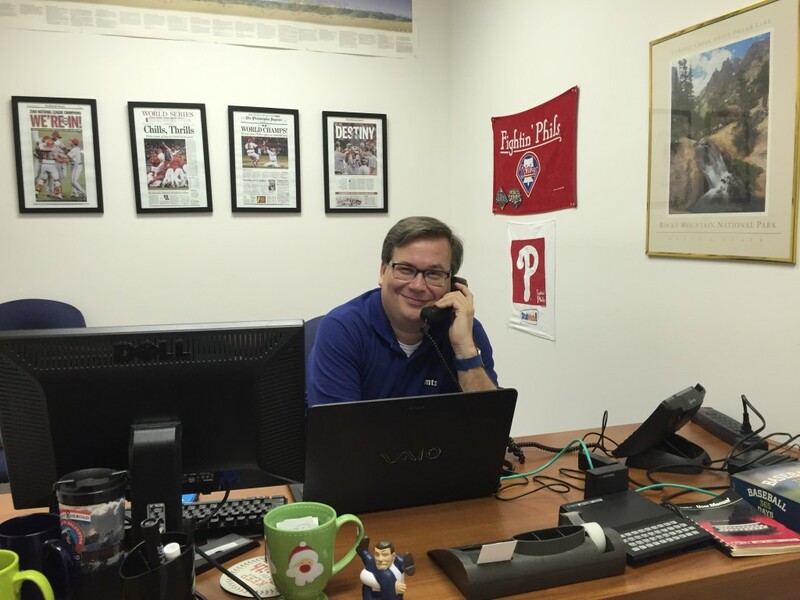 He’s standing by waiting to hear from you!